Forty years ago, on August 20, 1977, NASA's Voyager 2 spacecraft launched into space on a mission to explore the mysteries of the outer planets. A couple of weeks later, on September 5, its twin, Voyager 1, was launched. Though the spacecraft were designed with the same scientific instruments and both carry a Golden Record of earth sounds, pictures, and messages, they would ultimately take different tours of the solar system. In 1979, Voyager 1 discovered the first known active volcanoes outside Earth, on a moon of Jupiter called Io. Voyager 2 is the only spacecraft to have flown by all four outer planets—Jupiter, Saturn, Uranus, and Neptune. In 2012, Voyager 1, now almost 13 billion miles from Earth, became the first-ever spacecraft to enter interstellar space. Voyager 2, now almost 11 billion miles from Earth, is heading in a different direction and is expected to reach interstellar space in a few years. Guiding the Voyagers through all of their adventures—some nail-biting and others filled with the joy of discovering something new—has been the mission's long-time project scientist and Caltech's David Morrisroe Professor of Physics, Ed Stone. 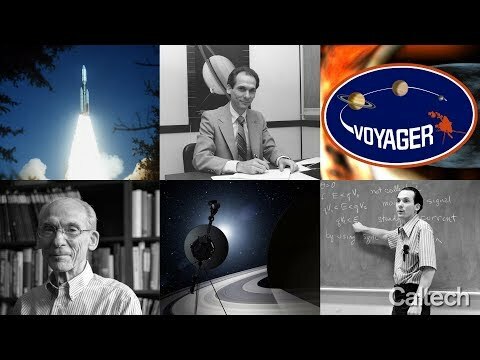 In a new video, Stone talks about being a professor at Caltech while serving as project scientist for Voyager at the Caltech-managed Jet Propulsion Laboratory, which operates the spacecraft. Stone also reminisces about receiving images and other data about the moon Io and arriving at the surprising realization that it erupts with volcanic activity. The video can be found online at: https://www.youtube.com/watch?v=xs-gJs1CKBY&feature=youtu.be. The launch of Voyager 2 in 1977.